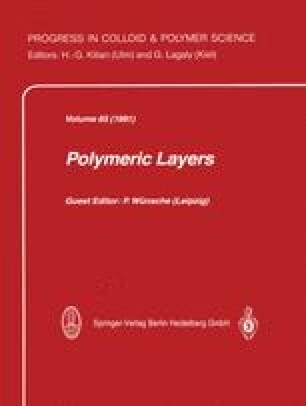 The paper reports on studies of a newly developed material which opens up new ways for the combined use of laser and computer techniques for advanced technological application. Poly(bis-ethylthio-acetylene) (PETAC) is easily soluble in halogenated hydrocarbons and aromatic solvents. Thin films of PETAC can be formed on various substrates such as glass, silicon, ceramics, metal or polymer. The layers are well insulating (σ=10−14 Scm−1). Electrically conducting paths or patterns with 10−1 Scm−1<σ<102 Scm−1 were directly generated by laser irradiation of PETAC layers with wavelengths of the visible and of the ultraviolet regions. The highest conductivity of laser modified PETAC was obtained by application of an Ar+-laser operating at λ=488 nm. The structurization of the materials is also possible by ablation. Sharp patterns were obtained by XeF-excimer laser emitting at λ=351 nm.